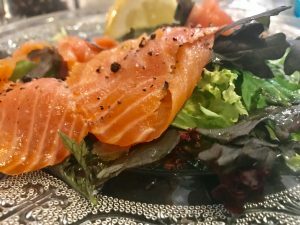 While finding gluten free in cities like Edinburgh is usually pretty straightforward, heading out into the Highlands and more remote areas is not quite so easy. A recent holiday in the North West Highlands has uncovered some great finds, which I am happy to share with you. Set in the tiny village of Ardelve, close to Kyle of Lochalsh and the popular Eilean Donan Castle, this bakery has been created by a German couple who have brought creative bakery to this remote area. For the gluten lovers the choice is endless: fabulous cakes, pastries and breads are piled up in a cute little cottage-style shop. With a couple of days notice, the talented bakers will create a delicious seeded gluten free brown loaf. I bought two and sliced one up to freeze for sandwiches when walking in the hills. The bread was totally delicious and even tasted like bread! Worth a detour (but call well in advance!). On the platform of Kyle Station, the Waterside Restaurant is a tidy little place, packed into an old waiting room. 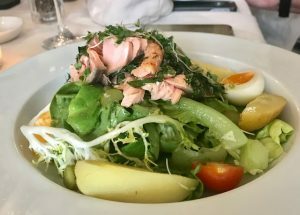 Serving brilliant, local and fresh seafood (+ vegetarian options) with friendly and relaxed service, there are plenty of options for gluten free and with warning for the chef, there are no issues with GF. I enjoyed a fantastic smoked salmon salad followed by some plump and tasty scallops in a creamy sauce. Plates are filled well and no one will go hungry. Highly recommended for a lunch or dinner, maybe on your way to Skye? Lovely Plockton! Tucked away in the North West, chocolate box houses and tons of fresh seafood. We enjoyed a superb dinner at the Plockton Inn: piles of huge scallops, tasty herrings, gluten free chips and some great atmosphere. This place gets packed and you need to book, but it’s worth it and the GF choices were wide and the staff were knowledgeable. So good I forgot to photograph it! 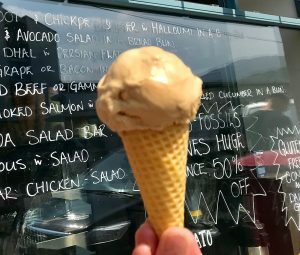 A great wee gelato and deli in Ullapool, Cafe Margot was an experience I will not forget: my first ice cream cone for four years! They serve some unusual and delicious ice creams, including morello cherry, salted caramel and chocolate and hazlenut. Really delicious and wow – I got to have a real ice cream in a GF cone! The cafe was really careful about contamination and it was a truly fabulous ice cream, enjoyed in the 26 degree sunshine. Joyful. The Ceilidh Place is famed for its fun vibe: live music, brilliant bookshop and craic around the bar. They kindly squeezed us in on a busy May holiday week and we enjoyed a great dinner in a room full of mouth watering paintings. It was amazing we didn’t buy any! The menu is clearly marked with GF options, so choosing is easy. My only gripe is the chips marked GF, on investigation are not actually GF and are cooked in the same fryer as gluten meals, which is really disappointing as some people might trust the menu when they order. That apart, the service was good and friendly, my starter of herring and horseradish came piled high with salad and was delicious, and a main course of steak and potatoes was not too huge to push me over the edge. Good flavours in a nice rural hideaway pub! Make sure you leave time to browse in the bookshop afterwards …. 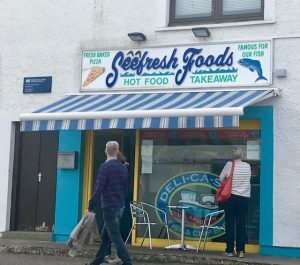 We found good gluten free chips available in Ullapool at Deli-ca-sea – call in advance so they can switch on the GF fryer; and at Hector’s Bothy in Kyle. Ullapool has a good Tesco with staple GF food. It also has a few good delis where you can pick things up. Kyle has a Co-op that has good GF too and the Spar in Balmacara is suprisingly good for wholefoods, vegetarian needs AND gluten free!